A very comfy and relaxing stay. The hotel was and always is very clean. The staff is very helpful and will try to assist you in anyway they can. The breakfast options in the morning are great and taste very good. We stayed at Grandma's Feather Bed two times on our trip to Alaska - once on our way to Glacier Bay National Park, and then again the night before flying home. The proximity to the airport was extremely helpful to our early morning flight schedule, and the drivers were so accommodating to take us wherever we needed to go. The room was comfortable, although I will say that the room we chose was a little loud. We were warned about this because it is directly over the breakfast room and lobby, but we chose it anyway because it had a king-sized bed. The staff were accommodating to anything we asked. My only disappointment is that we didn't book the restaurant in advance - it was totally booked for both of the dinner times we were there. We had heard great things about it and wanted to try it. This is an awesome hotel. I needed to check in early and they worked with me to get me in right away. The room they had was under the stairs and they were afraid my husband would not get the rest he needed. When I told them he could sleep through almost anything, they let us right in. Instead of waiting til 3p.m. to check in, I was able to get a room for my husband by 9 a.m. The room was so clean and comfortable. I loved the tub. After my travels it was nice to relax. The noise from the stairs was minimal. The food in the restaurant was excellent as well. My husband had slept in an airport the night before and was really tired so it was nice they let us in right away so he could get the rest he needed. This is the best place to stay in Juneau. The breakfast was fabulous and our room was very attractive, appealing, clean, and nice. We felt pampered. The staff was helpful and friendly. It's a great location to just come and go from. The outside of the building could use some updating but don't let that scare you away. The inside is nicely decorated and extremely pleasant. We would definitely return here. This was my second time staying at Grandma's feather bed. I stayed in room 206 that has a great comfortable queen bed and a day bed in it. It is beautifully decorated and i sure took advantage of the wonderful jacuzi tub. They also have shuttle service into downtown Juneau and back. The shutlle will also drop off at the hospitals and shopping centers. Loved it! I highly recommend staying there. Great place to stay and eat. My husband and I had a weekend getaway and stayed in a clean well-apportioned second floor room with king size bed and down pillows. The split level room had French door entry to a spacious double sized jet tub with shower. Towels, linens, and bedding were fresh and clean. Fridge, microwave, iron, hair dryer, shampoo, lotion, and Keurig were appreciated. Staff very friendly. Free Breakfast included options of continental (muffins, yogurt, melon, juice, milk, coffee, tea); or hot breakfast with choice of three items (eggs, sausage, bacon, pancakes, French toast, herbed potatoes, toast). Dinner is also a good venue usually with a specialty salmon or halibut entree, along with mainstream items that kids will like. We enjoyed our stay here very much. The staff was very friendly and helpful and the room was beautiful, clean and relaxing. The restaurant served up a delicious, hot and hardly meal in a cozy and comfortable dining room. The complimentary breakfast was tasty too. We will stay again if we are in Juneau as well as recommend it to others. It is conveniently located a short distance from the airport. My husband and I stayed here during our last couple of days of our Alaska Trip for our 20 year wedding anniversary. We had a lovely romantic room. Laura and Mechayla we wonderful young ladies that had great recommendations. Felt like I was leaving family on check out day. We only had breakfast here, and really enjoyed the front table by the window. We would definitely come back! 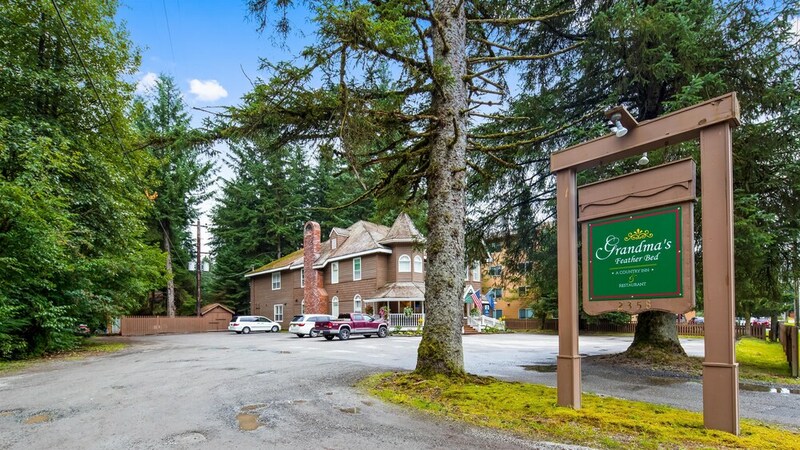 Located within 2 miles (3 km) of Mendenhall Golf Course, Best Western Grandma's Feather Bed is within 3 miles (5 km) of University of Alaska-Southeast. This 14-room, 3-star hotel has private in-room spa tubs along with free in-room WiFi and free self parking. Free full breakfast is included with your stay and awaits you each morning from 6 AM to 9 AM. Enjoy a bite to eat at Grandma's, the hotel's onsite restaurant. A TV comes with cable channels, and guests can stay connected with free WiFi. The bathroom offers hair dryers and free toiletries. Other standard amenities include private spa tub, a refrigerator, and a microwave. Best Western Grandma's Feather Bed features free WiFi in public areas, conference space, and a business center. You can take advantage of free parking, along with a free airport shuttle (available 24 hours). The front desk is staffed 24 hours a day to help with luggage storage and dry cleaning/laundry. Additional amenities include a computer station and laundry facilities. Free full breakfast is served daily from 6 AM to 9 AM. Grandma's - Restaurant specializing in international cuisine. Open select days for breakfast and dinner. The preferred airport is Juneau, AK (JNU-Juneau Intl. ): 3-min drive, 0.7 mi/1.1 km. The front desk is open 24 hours a day. For convenient arrivals and departures, you can take advantage of the airport shuttle (available 24 hours). Driving? This property offers free parking.